Many people mistakenly believe that, just because tax season is over and summer is here, there is nothing you can do to prepare yourself for next tax season. That’s just not true! There are ABSOLUTELY steps you can take now that will save you HOURS later on this year. 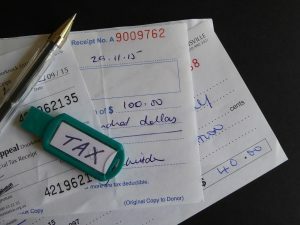 In a previous blog, we talked about getting organized and filing receipts into their proper categories either weekly or monthly. If you missed that blog, click HERE to check it out! Getting organized alone will save you hours of time and headaches as next year’s filing season draws closer. Another thing you may want to check on this time of year (especially in light of all the changes with tax reform) is your withholding allowances which you file on your W4 form with your employer. If you owed taxes this past tax season, you likely didn’t have enough withheld from each paycheck. If you got a large refund, odds are, you withheld too much. No one wants to have a huge tax bill come April, but getting a huge refund means that you loaned good ole’ Uncle Sam your money for the entire year interest free (which isn’t good either).It’s a fine line to walk, but ideally, you want to have just enough withheld so that you don’t owe taxes at year-end, but not so much that you end up with a huge refund. With it only being July, it’s not too late to change those withholding allowances so that you don’t have a repeat situation of last tax season! Here at Wealth Builders, we specialize in all things financial! If you have questions on how to most accurately estimate your tax liability and appropriately choose the most accurate withholding allowances, we can help! Give our office a call today and schedule your free consultation! Don’t miss a thing! Follow Wealth Builders on LinkedIn, Twitter, and Facebook for all things financial! If you haven’t already, sign up for our free quarterly newsletter and weekly “Tax Tips” email. Both are full of lots of great information and tips to help you keep more money in YOUR pocket by decreasing your tax liability and increasing your cash flow. Sign up today ! “Taxpayers Who Owed Tax This Year Should Check Their Withholding Soon.” Internal Revenue Service, www.irs.gov/newsroom/taxpayers-who-owed-tax-this-year-should-check-their-withholding-soon.